If you are looking to get on a boat this season for racing or cruising, or if you’re a captain who needs crew for his or her boat, Points East crew match is how you’ll connect with the people and boats you need. We maintain a detailed, searchable database of potential crew and captains for our Points East distribution area, which extends from southern Connecticut to Downeast Maine. This service is FREE. To get started select one of the links below, to either submit your listing or search listings currently online. Please note that we review all posts before placing them in the database and reserve the right to delete inappropriate posts. While we do our best to screen posts, we cannot guarantee the safety or legitimacy of any posting. 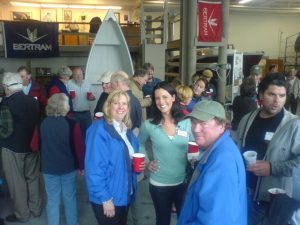 A Points East crew match party is the perfect opportunity to meet and mingle with potential crew and skippers and have some great food and beer to boot. Best of all, it’s FREE! When: May 1, 5:30 – 7:30 p.m.
Sponsors: Points East, Handy Boat, SailMaine, Hallett Canvas and Sails, Hamilton Marine, West Marine, Gritty’s, Town Landing Market and PedPox.